Fencing started as an essential pastime to prepare men to defend themselves to attack their enemies. A fencing match is depicted on an Egyptian temple that dates to about 1190 B.C. and the ancient Babylonians, Greeks, Persians, and Romans all had some form of fencing. With the development of armour in the Middle Ages swordsmanship became virtually obsolete. The broadsword could be used against armour, but only as a crude hacking device requiring sheer strength rather than skill. The idea being to damage the armour, stop joints working and get the warrior on the ground to finish him off. Later, in the 15th century, the development of firearms made armour obsolete and brought swordplay back into prominence. Soldiers once again had to acquire expertise with the sword and fencing emerged as a pastime for gentlemen. Fencing masters organised guilds, which taught various ‘special’ moves to their pupils, while protecting them as trade secrets from outsiders. The swords of that period were still rather heavy, and blows with the edge were emphasised. Tactics included wrestling holds and tricks designed to disarm or immobilise the opponent to set him up for the killing blow. Blade manufacture improved in the 16th Century and the Italian masters developed the longer, lighter rapier and this led in turn to more use of the point and an increase in speed and skill. Because of the rapier’s length opponents had to fight at a distance and quick but controlled lunges, attacking the enemy with the point of the sword, replaced cruder hacking techniques. However the long length of the rapier meant that it was not a good defensive weapon, and the fencer often had to use his gloved free hand or a dagger to deflect his opponent’s thrusts. The French court of Louis XIV, with its emphasis on fashion, led to the production of a new shorter sword which could be worn with the court dress. The court sword, as it was known, turned out to be an excellent weapon for fencing because it was both lighter and stronger than the rapier, so it could be used for defence as well as offence. Now, for the first time, the modern one-handed fencing technique developed, with the spare hand and arm used primarily for balance. A special version of the court sword, the foil, was developed for practice. Meanwhile, another type of sword, the colichemarde, had been created for duelling. The blade had a triangular cross-section, with slightly concave sides to reduce weight without reducing strength. 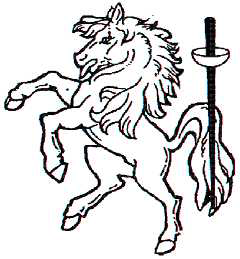 The colichemarde evolved into the modern épée. The third of the fencing weapons, the sabre, was introduced into Europe in the late 18th century as an adaptation of the Turkish scimitar, used by the Hungarian cavalry. It was so effective that other armies began using it and another variation, the cutlass, became a standard naval weapon. The sabre was originally a very heavy, curved sword, but a lighter, more easily wielded weapon with only a slight bend was developed in Italy late in the 19th century for duelling and fencing. The modern fencing weapon is straight, like the foil and epee, but it still has cutting edges which can be used to make hits on an opponent.